The Department of Agriculture was created in 1882 as the Department of Agriculture, Assam. However on attaining statehood it was bifurcated and renamed as the Department of Agriculture, Meghalaya. The Department of Agriculture, Meghalaya has been functioning as an integrated entity comprising the various spheres of development in Agriculture, Horticulture and Minor Irrigation. The mandate of the department is to bring about increased crop production and productivity. 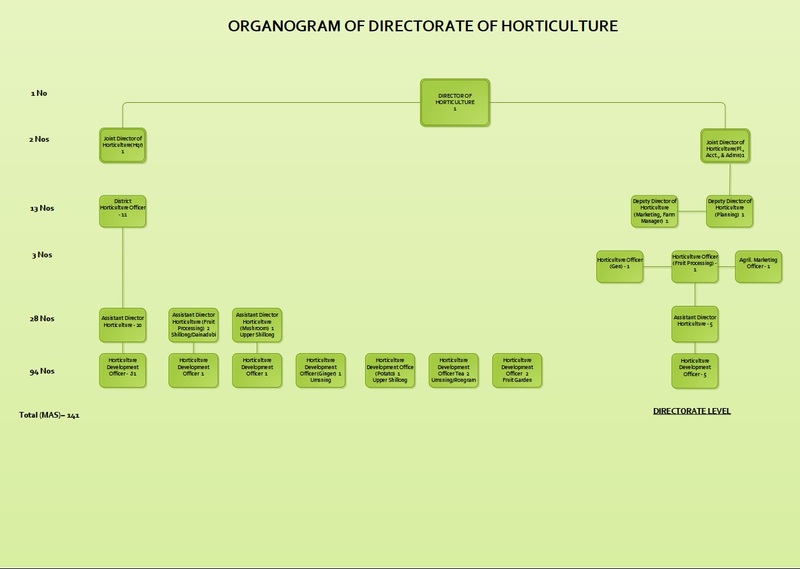 However, for effective administration in streamlining the developmental activities, the Directorate of Horticulture was created in 1995 and the Directorate of Irrigation in 2001. The three directorates were in operation within the same administrative control of the Department till the Dec 2010 where the Directorate of Irrigation was carved out as a Water Resources Department. To promote holistic, sustained and equitable intervention for attaining food security; conservation, management, protection and sustainable use of natural resources for improved livelihood; generating gainful rural employment opportunities to alleviate poverty and striving towards an overall balanced economic development of the farming community. To propagate modern agricultural production techniques and scientific methods of farming for increasing crop output; making our farmers self reliant and to accelerate the economic growth of the State. Attaining Food Security and Sustainable Growth by increasing production of food grains and improving productivity. Popularise Participatory Approach to agriculture management through watershed programmes and Self Help Groups at village level. The Directorate of Agriculture was set up with the objective of implementing farmer oriented schemes of the State and Centre. The Directorate formulates various schemes for harnessing the potential of human and natural resources available in the State, for which active participation of the farming community in the implementation is of utmost importance. Functioning on a farmer first principle, it provides technical advice and services to the farmers. The policy of the Department is to evolve as a knowledge based entity providing technology, skills and knowhow to the farming community. It is in this context that the advantages offered by information and communication technologies(ICT) has become a key differentiator where information sharing, knowledge networks including faster and efficient dissemination of information can empower the stakeholders and create economic growth. The Directorate provides Agricultural Extension services to farmers including transfer of the latest technical knowledge to the farming community. The introduction of high yielding varieties, field demonstrations, imparting training to farmers to improve skills & knowledge to boost up the agricultural production and productivity are other complementary functions. The Directorate also assesses requirements of agriculture inputs well in advance and monitor timely supply of seeds, fertilizers and pesticides, implements, credit etc., to the farmers. Extending technical assistance to various agencies etc. 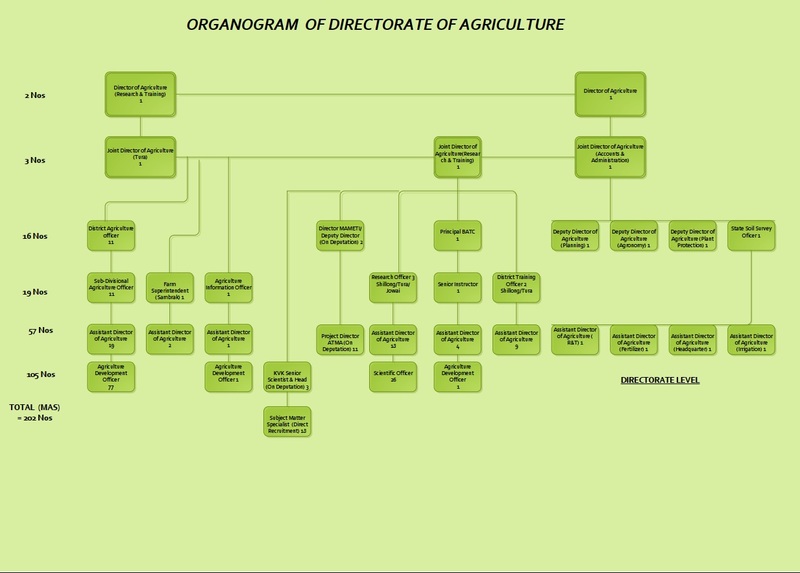 The Directorate of Agriculture is headed by the Director of Agriculture who is assisted by three (3) Joint Directors of Agriculture – Joint Director of Agriculture (Administration & Accounts), Joint Director of Agriculture (Research & Training) based in Shillong and Joint Director of Agriculture based in Tura. In the Directorate, the Director of Agriculture is also assisted by 7 (seven) Deputy Directors of Agriculture namely, Deputy Director of Agriculture (Agronomy), Deputy Director of Agriculture (Plant Protection), Deputy Director of Agriculture (Planning), State Soil Survey Officer, Agriculture Executive Engineer (Mechanical), Monitoring & Evaluation Officer and Agriculture Census Officer. Further, there is 1 Agriculture Information Officer, 1 Research Officer (M & E), 1 Asst. AIO and 1 Assistant Development Officer(info), 2 Research Officers (Planning and Statistics), 1 Senior Research Officer(Census), 1 Finance and Accounts Officer, 4 Subject Matter Specialist and 1 ADO. At the District level, there are 7 (seven) District Agriculture Officers - one for each district in the State. The District Officers are assisted in the field by the Sub-Divisional Agriculture Officers (11), Research Officers(3), Subject Matter Specialists (16), ADO’s(7), Farm Supervisor (1), Assistant Directors (3), ADO’s (5), Scientific Officers (19) including Field Assistants and Agricultural Demonstrators. At the Sub-Divisional level, there are 11 (Eleven) Sub-Divisional Agriculture Officers who are assisted by the Agriculture Development Officers, ADO (Headquarter) (15), ADO (Circles) (16) and the Agricultural Demonstrators. At the Block level, there are 39 (thirty nine) Agriculture Development Officers who are assisted by the Gram Sevaks of the Community & Rural Development Department.